Lemon Cheesecake Bars: layers of cookie crust, lemon cheesecake and lemon cookie bars! One of the most delicious desserts ever, you won’t be able to stop eating these! If any of you follow my blog for new updates, you may have noticed last week I dropped to only two new recipes. I meant to share these Lemon Cheesecake Bars on Thursday…but I was curled up in a ball crying in the corner. You see. As excited as I am that my son has plans for his post high school life…it also terrifies me. I have mentioned before that he is heading off to Marine boot camp this summer. Well, we found out his date has moved up and it’s 3 weeks away. I just want to hold and protect him forever. But you see, that’s the switch that happened. I’ve spent the past 18 years loving him, helping him learn and grow into the man he is today. 18 years of protecting him. Now, he is the one who is leaving the nest to protect ME. And you. I’m so extremely proud and humbled by this thought. So bear with me the next few weeks as I am sure to be a mess of emotions! You know what helps? Yep. Eating my emotions. I’m that kind of person. And these Lemon Cheesecake Bars are here for me when I’m feeling sad and scared. And after I’ve eaten the entire batch, I guess I just need to make some more, right? Last month I proclaimed these Snickerdoodle Cheesecake Bars one of the best desserts I’ve ever made. And now I went and made them with a lemon twist. Which is pretty much my favorite flavor treat…I adore LEMON desserts. So I’d like to amend my previous statement and declare these Lemon Cheesecake Bars THE BEST DESSERT EVER MADE. I’m totally losing credibility with you guys. Right? But, before I lose you. Make these. Then you’ll trust me again!! If you’re looking for the best Lemon Bars with Shortbread Crust, this one is it. Easy cookie crust with a sweet and tangy lemon filling and lemon glaze, topped with powdered sugar! 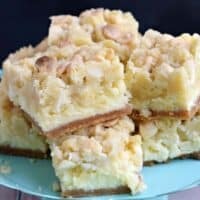 Here are some more Cheesecake Bars you’re sure to enjoy!! 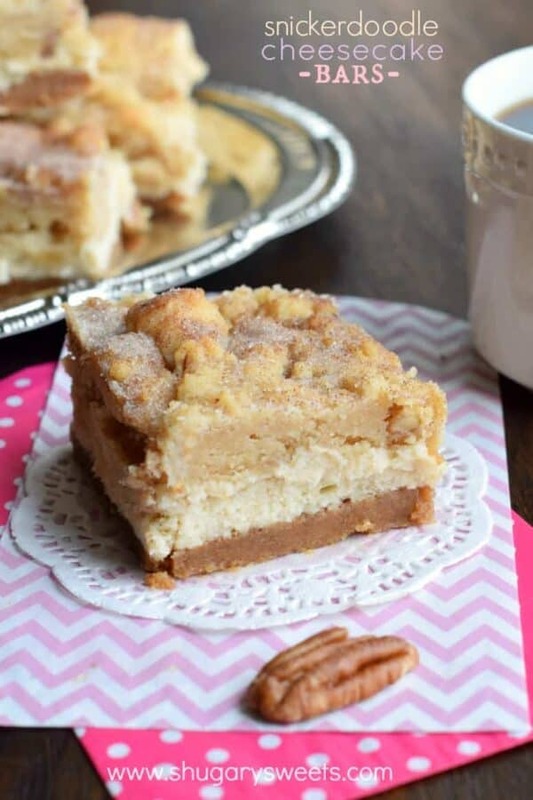 Snickerdoodle Cheesecake Bars: a sweet and salty crust topped with a divine cinnamon sugar cookie! 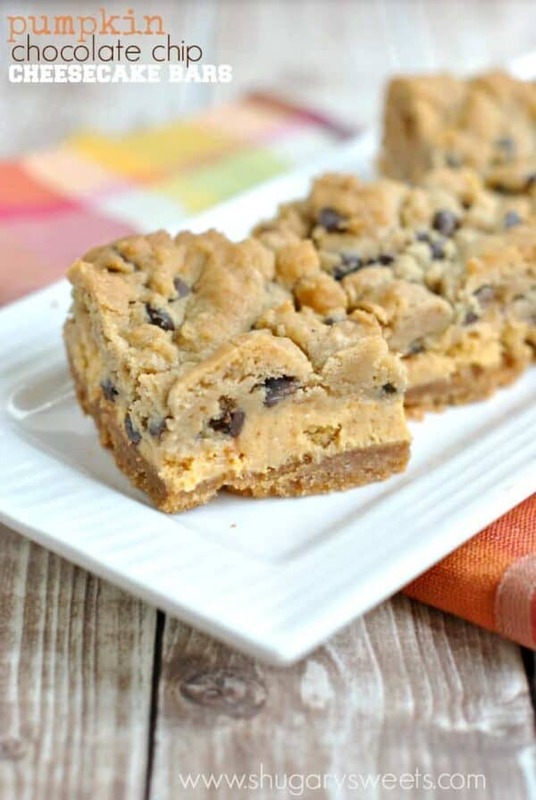 Pumpkin Cheesecake Bars: the pumpkin cheesecake filling with the chocolate chip cookie is perfect ANY time of year! 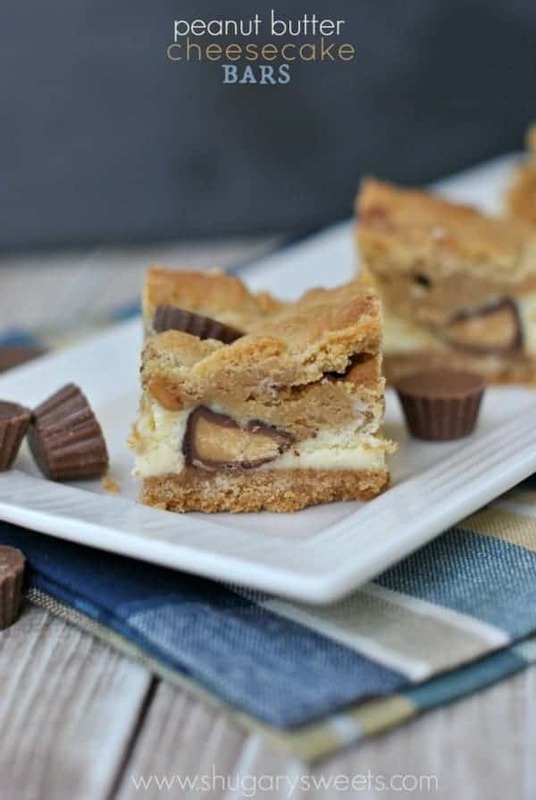 Peanut Butter Cheesecake Bars: a peanut butter cookie with extra Reese’s gives this cheesecake bar a decadent twist! Sweet Lemon Cheesecake Bars have a graham cracker crust, lemon cheesecake filling, and white chocolate chip cookie topping! Line a 13x9 baking dish with parchment paper. Set aside. Preheat oven to 350 degrees. In a food processor, pulse Nilla Wafer cookies with sugar until fine crumbs. Add in melted butter and pulse until combined. Press crumbs into the bottom of prepared baking dish. Using the palm of your hand, press crumbs firmly until they are pressed into the bottom of the dish. For the filling, beat cream cheese with sugar, eggs, lemon extract and lemon zest using the whisk attachment of your electric mixer. Beat until fluffy and smooth (about 3-4 minutes). Pour over cookie crust. For the cookie dough, beat butter and sugar for 2 minutes. Add egg, vanilla and lemon zest and beat until combined. Add in baking powder, salt and flour, beating until fully blended. Fold in white chocolate morsels. Scoop dough by large spoonfuls onto the top of the cheesecake layer. Use your fingertips to spread gently until covered. Bake for 30-35 minutes until lightly browned. The center will still be jiggly, that's okay. Allow to cool completely. Refrigerate for 4 hours (or overnight). Slice and serve COLD. Enjoy! 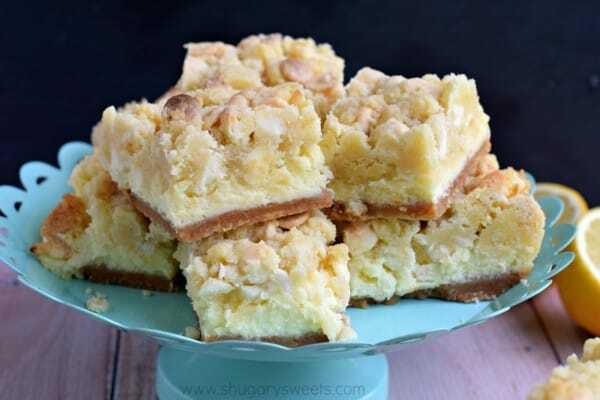 Today’s recipe for Lemon Cheesecake Bars was originally published on Shugary Sweets on June 22, 2015 and has been republished in August 2018. Aww, YOU are awesome Marye 🙂 Wish I could share a plate of these with you and talk about our grown up kids! Lemon is a perfect summer flavor. Add in Cheesecake and you have my heart! This looks sooo yummy! 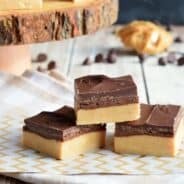 There are so many delicious things going on in these bars!! Girl, I can’t even imagine the emotions you must be going through right now. What an honor though to know that you have raised such an awesome young man who wants to serve and protect his country. It’s making me tear up and I don’t even know him. I’m thinking we definitely need to plan a meet up after he leaves. You are going to need some coffee and chit chat and lots of sweets! 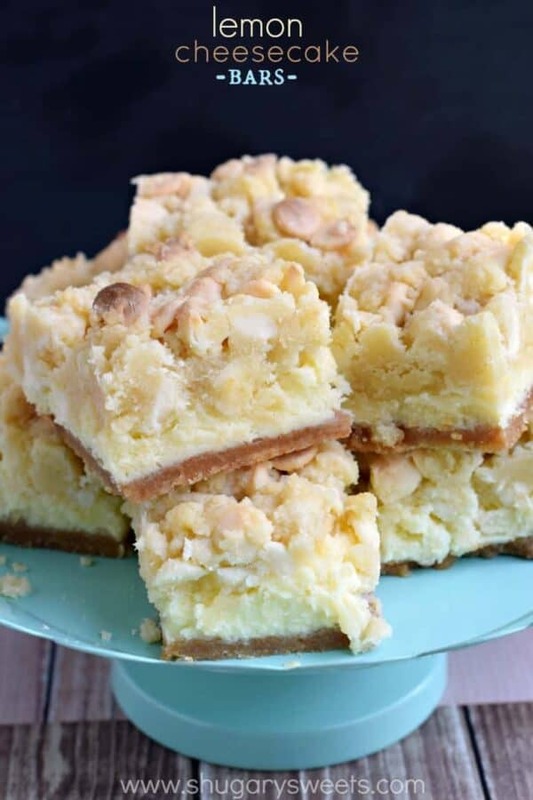 And I need these lemon bars…hint, hint! Love that we both had lemon on the brain today! I have been looking forward to this recipe since I saw it on Instagram! My oldest (son) tried college, decided it was boring and began exploring his options. He looked into the Coast Guard and then the Marines. He decided to join the Navy and give their special forces training a shot. He made it through; has told us many amusing and terrifying stories. He just got back from his first deployment and is already beginning training for his next one. It certainly was not my first choice for him but we are so proud of him and he is loving it. Hang in there. It is tough to let them go but they mature so much and so fast. He is an amazing young man. Please thank your son in advance for his service. Um, I have to admit this post made me tear up a bit. I can’t imagine sending my girls on their way once they’re old enough to go to college (or boot camp)… I still have some time since they’re 1 and 3 but still. You must be so proud of your son for choosing a path where he will be putting others first. Great job! And many hugs and lemon bars to you in three weeks. I am so proud of him you have no idea 🙂 But I’m still sad. Sad that me, being selfish, can’t just call him whenever I want or have him come home every weekend. But, I’m so incredibly happy that he is following his dreams. That’s ultimately what we want for our children 🙂 Thank you for the sweet comment!! Oh my word – talk about insanity! I love these cheesecake bars so much. And omg, I’m totally here for you if you need a shoulder to cry on… or someone to binge eat with! Ha! Thanks girl 🙂 On a brighter note…I will now definitely be at BlogHer food! Hi Aimee, I just wanted to reach out to you because I know a little bit of how you’re feeling. My younger brother just finished Marine boot camp two weeks ago and the past few months have been a whirlwind of emotion. His date was actually moved up a few weeks early as well (and at the very last minute), so I understand how unnerving that must be for you. I’m sure your son will excel and rise to the challenge. It’ll all be okay. Just hang in there! I’ll be keeping you and your son in my thoughts. It is definitely unnerving to have the date changed…even though we knew (and in a small way wanted) it to happen for him. THanks so much for the sweet comment. Good luck to your brother too!! I can’t imagine how difficult it is for you right now to think of what’s ahead! I would definitely be downing the desserts! Thanks in advance to your son for his service! I can’t imagine the emotions you’re going through. Hugs for you. But I have to say — I love the combination of flavors here! Aww big hug for you. I’d definitely be eating my emotions and It’d most likely include a whole pan of these bars. They look amazing! And these bars look delicious! I’m a sucker for lemon! 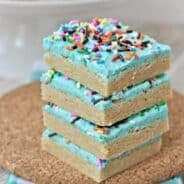 These bars look absolutely amazing!! Be sure to fill your son up with those yummy treats before he heads to bootcamp. He won’t be eating anything like it for 12 weeks and he will definitely be thinner when you see him on family day. Make sure you bring lots of tissues on graduation day. My husband is a Drill Instructor in San Diego so I’ve been to many graduations and I tear up with pride every single time. Best of luck to you and your son!!! Tell your husband to be kind to my son and I’ll send him a batch of these bars 😉 Thanks for the sweet comment!! You must be so proud!! But I can’t even imagine how you feel. I do not blame you at all for eating your feelings! Plus, you need to bake as many treats as possible for your son before he heads off! I’m trying to fatten him up as much as possible 🙂 And yes, we’re so proud!! Thinking of you and your son as he moves on to the newest chapter in his life. So proud of him for protecting our country! Thank you Eva! We’re very proud of him too! Hawaii was such a blast. And it was a great way to connect and build memories before he leaves 🙂 Thanks for the sweet comment! Eating your emotions is only fair in this circumstance, Aimee. I mean, you raised this amazing person, and now he’s headed off to do such noble, selfless work. I’m sure you’re gonna cry buckets over the next 3 weeks, but remember, you did good. I’m a high school teacher and I see a lot of good kids, but I also see a lot of kids graduate from high school feeling totally lost. You are the kind of parent who doesn’t let that happen! And these bars are amazing. I can’t think of a better way to bake your feelings. Thank you Mir! He’s definitely following his dreams. It’s our job as parents to encourage and support (even if we want to just wrap them in our arms and never let go)! Is there really 3/4 CUP of vanilla extract in the cookie layer? wonderful too, I plan to make some soon. Could you substitute fresh lemon juice for the extract and how much? I made lemon bars for Easter dinner dessert, and they were a hit! Oh my gracious, they were delicious! I used 3 drops of Young Living Lemon essential instead of lemon extract, and the cheesecake was light and refreshing! I would never recommend ingesting any other brand of lemon essential oil, just because of safety concerns. I’m planning on making this dessert for my son’s graduation party soon! Thanks for the inspiration! I increased the ingredients by 1 1/2 times as a 9×13 baking dish is very large. I also decreased the sugar in the cookie layer by 1/4 cup and omitted the chocolate pieces as the cake would have been too sweet. The bars turned out great. Yay, thanks for the tips! Thank you for such an amazing recipe!!!!!!!!!!!!!!!!!!!!!!!!!!!!! I made this for church coffee hour. It is fantastic! Like another, I used 2 drops of essential oil too. Wouldn’t change a thing. So good, right? One of my favorite recipes, seriously!!! My daughter just retired from the US Air Force and I’m so, happy she does not ever have to go back over seas again. My heart is with all of you that have son and daughters and other family members in the Armed Forces. I do want you to know when you send goodie bags send extra. My daughter said that the worst thing about me sending her stuff was seeing the faces of the ones who don’t get things from home. So please always send extra for them to share. Can you freeze the lemon cheesecake bars? This may sound stupid, but do you put the lemon juice and zest in the bars or just the zest? I live in the UK and I’ve never heard of Nilla wafers! Can anyone recommend an alternative? 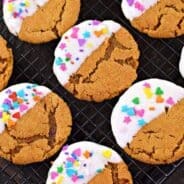 I would love to be able to make these..
You could use butter cookies, shortbread cookies, or even graham crackers! I’m trying to stagger my baking for a graduation party in mid-May and wonder how many days in advance of the party I could make these. Congratulations on your son’s service. My husband is a retired Marine. Thank you so much! What does tp stand for? Im not sure if that was a typo on the baking soda or not. 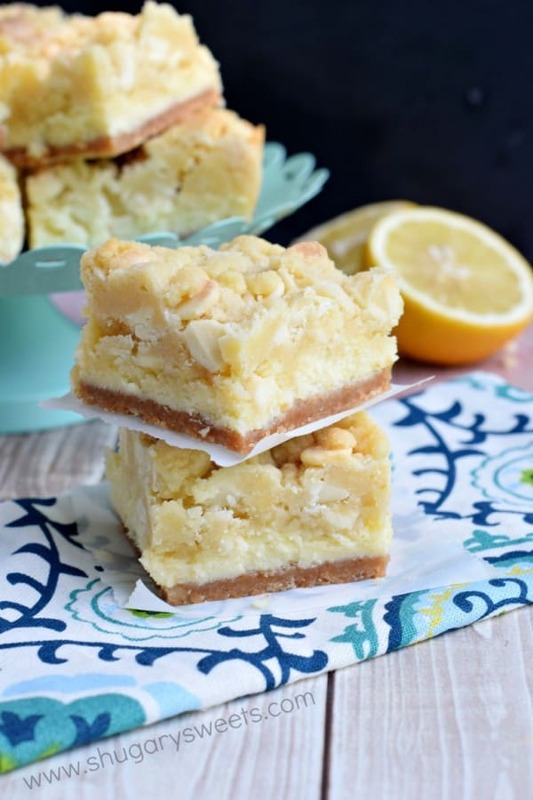 These lemon cheesecake bars look AMAZING! But then I scrolled down the page and saw your Snickerdoodle cheesecake bars, so I don’t know which one I want more right now. But I’m saving these recipes for sure! Hi, My party is in 2 weeks can I make these now and reserve in the Ridge. Lemon Cheesecake Bars. What are Nilla Wafers, never heard of them in uk. Can you recommend an alternative? Can lemon Oreos be used for crust instead of Nikka wafers?